Charter yachts come in a variety of shapes and sizes, but they have all been designed with one thing in mind: to give you as much enjoyment as possible. 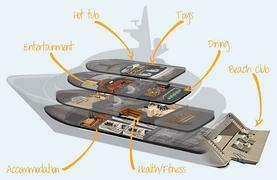 Here we explore some of the features common to all charter yachts, and some that are less so. A charter yacht defies comparison to any land-based luxury resort. Designed by the worlds leading yacht designers and conveying magnificent displays of craftsmanship, superyachts are themselves floating works of art. Within each carefully executed interior lies a world of luxury, specifically designed for relaxation, entertainment and gourmet dining. In addition, each charter yacht is equipped with all of the toys needed to thoroughly enjoy a holiday charter on the sea. With hundreds of charter yachts from which to select, there is a charter yacht out there that will suit your taste and lifestyle. 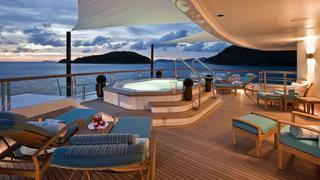 Charter yachts offer the ultimate in accommodation for every charter guest. Most charter yachts will allow a maximum of twelve guests, although some larger yachts are certified to allow more. Each stateroom will be luxuriously appointed and will feature a private en suite finished in rare marble or stonework and offering an unrivaled spa experience. 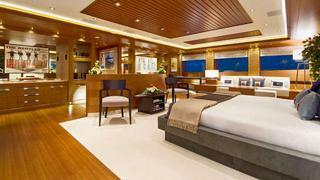 Many yachts have VIP staterooms and each will also have a master stateroom. The master suite is an oasis unto itself, often overlooking the sea, perhaps with its own private terrace, and always featuring the most heavenly bedding and finest linens. One of the most important activities aboard a charter yacht involves food  the finest gourmet cuisine prepared specifically for you by your personal master chef. Yacht chefs are world-class and many have been awarded Michelin stars. Yacht galleys are state-of-the-art and the yacht crew has been professionally trained in five-star silver service. Once you select your charter yacht, your charter agent and the yachts chef will work with you to account for any food allergies, cuisine preferences, likes or dislikes. From divine four-course meals featuring the finest of ingredients, fresh herbs from the onboard herb garden and local provisions from your charter destinations, to the hors doeuvres and off-hour nibbles served along with the finest champagne, top-shelf libations and cleverly crafted cocktails, dining aboard a charter yacht is a memorable experience unto itself. Every charter yacht is equipped with a state-of-the-art entertainmentsystem, which will allow for a vast array of on-demand movies and music to be played right in your stateroom or anywhere onboard the yacht. Many also have strategically placed docking stations to allow you to play your personal playlists whenever the mood strikes. While some charter yachts feature a private theatre, most offer theatre screens or large screen televisions and sumptuous furnishings from which you can enjoy a snack and watch a great movie after an exhausting day of relaxation. In addition to spa pools of all shapes and sizes and plentiful sun pads for lounging, charter yachts also feature a broad array of toys and equipment to suit your charter plans and destination. Adventure enthusiasts might enjoy heli-skiing or a simple exploration flight from a helicopter that can retrieve guests directly from the yachts helipad. How about some serious underwater exploration with a private submarine or for a truly rejuvenating experience, how about a yacht with a full onboard spa or hammam? Many charter itineraries take guests to the worlds most spectacular diving grounds, thus most charter yachts are equipped with a dive centre and at least one member of the crew will be a certified dive master. Fitness enthusiasts will not have to compromise on their land-based workout routines, as many charter yachts feature air-conditioned gymnasiums. From waverunners and seabobs to boogie boards and snorkel gear, your charter yacht can be equipped with whatever water toys you may desire.